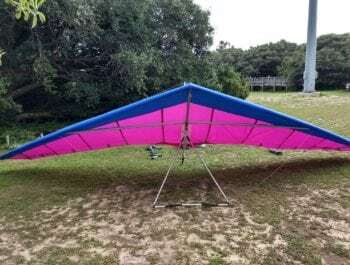 Used | Moyes Sonic 165 Bright Yellow Mylar LE/Dacron Violet, Purple, and White under-surface with speed bar and waterproof bag. 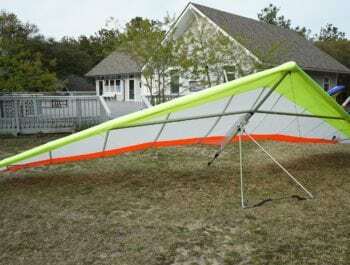 The Sonic was designed as a novice/intermediate glider with a 60% double surface wing and neutral static balance for improved maneuverability. In addition, the Sonics’ slow speed handling properties allow the pilot to soar with minimum effort and maximum safety while aiding in trouble-free landings. 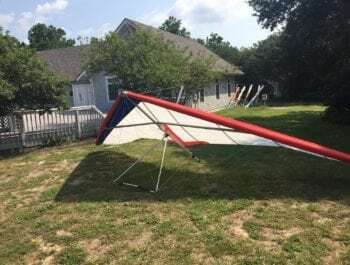 Excellent Novice/Intermediate glider for a pilot with a hook-in weight of 120-220lbs.